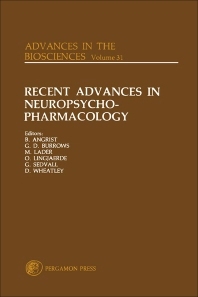 Recent Advances In Neuropsychopharmacology contains selected papers from the 12th Congress of the Collegium Internationale Neuro-Psychopharmacologicum held in Gõteborg, Sweden, 22-26 June 1980. The 47 papers in the volume are organized into six parts. The papers in Part I deal with the subject of psychostimulants in psychiatric research. Topics covered include the effect of chronic d-amphetamine and chronic apomorphine treatment on non-human primate social and solitary behavior; and the behavioral effects of dopamine agonists. Part II assesses the prescription of psychotropic drugs by general practitioners. Part III examines blood platelets as a model system for central monoaminergic neurons. Part IV focuses on anxiety pathways in the brain. Part V considers prospects for a biochemical classification system in psychiatry. Part VI presents pharmacokinetic studies of psychotropic drugs. Part VI contains two papers on the renal function and renal histology of lithium patients on maintenance lithium therapy and pre-lithium patients; and the treatment of refractory schizophrenia.